The Gladstone Institutes is pleased to present the second annual Ogawa-Yamanaka Stem Cell Prize to Douglas Melton, PhD. Melton is co-director of the Harvard Stem Cell Institute, the Xander University Professor at Harvard University, and an investigator of the Howard Hughes Medical Institute. Melton studies the early development of pancreatic beta cells, the cells that produce insulin. In his work, he identified a robust method to create beta cells from stem cells, with the ultimate goal of using them to treat patients with diabetes. Melton is also a pioneer in direct cellular reprogramming research—the transformation of one type of adult cell into another, without first going through a stem cell state. In 2008, he transformed exocrine cells in the pancreas, which produce enzymes to help digest food, into insulin-producing endocrine cells in a mouse. This achievement marked the first successful reprogramming of adult cells in a live animal. 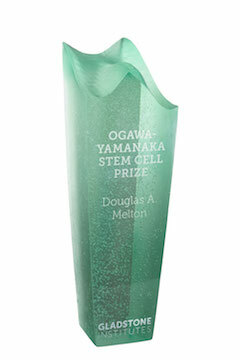 The Ogawa-Yamanaka Stem Cell Prize recognizes individuals whose original translational research has advanced cellular reprogramming technology for regenerative medicine. The prize was established through a generous gift from Hiro Ogawa and is supported by the Gladstone Institutes. It also honors the memory of Betty Ogawa and continues the philanthropic legacy she shared with her husband of 46 years. The inaugural prize was presented to Masayo Takahashi, MD, PhD, in 2015 for being the first person to transplant cells derived from induced pluripotent stem cells (iPSCs) into a patient. iPSCs were discovered by Gladstone Senior Investigator and Prize namesake Shinya Yamanaka, MD, PhD. Melton was selected as the prize recipient from a pool of outstanding nominees by an independent committee of stem cell experts. He will give a scientific lecture and be presented with the award and an unrestricted prize of $150,000 USD at a celebration at the Gladstone Institutes in San Francisco, CA on September 28, 2016 at 11:00 am. The lecture and ceremony will be available via live-streaming. Ogawa-Yamanaka Prize committee members include George Daley, PhD (professor of hematology/oncology and director of the Stem Cell Transplantation Program at Boston’s Children Hospital), Hideyuki Okano, MD, PhD (chairman of Keio University Graduate School of Medicine), Shinya Yamanaka, MD, PhD (senior investigator at the Gladstone Institutes and director of the Center for iPS Cell Research and Application, Kyoto University), Srivastava, and Wernig. The 2017 nomination process will be open from January 1, 2017 to March 30, 2017. Selection criteria and the nomination form can be found online.